I have a Greenbrier that has an 80 hp that could use more muscle or might find another car that could be needing some power. Right now it is a salvage operation. It is also a training exercise for fixing the turbo engine I have with a rusty #6 piston/cylinder later down the road. I have been working on interior, brakes, suspension and other systems on my Camaro, it was nice to play with an engine for awhile. This will help me some when I get started on my other engine. I did soda blast the block last week and lightly painted it with high temp aluminum VHT paint. The Greenbrier was a nice break for awhile, but it is ready to run. Just waiting on Rick to help me finish up on my first in depth engine service work. 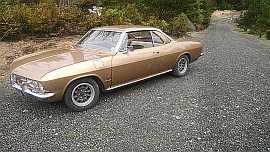 Have to get back to the Camaro and get the head liner in as soon as I have the piston in this engine. Windshield and backlight come out Wednesday to fix improperly installed & missing trim` clips. Progress today was significant. Rick dropped over and we did horoscope with 2 different types of horoscopes to get the best views we could of the left cylinders internals. End result is all left cylinders piston and valves look real good. Head will remain in place. Oil pan was cleaned and found to have a permanent imprint of the oil pickup. A replacement pan has been bead blasted and prepped for paint. Several other pieces were bead blasted and prepped for paint. Now it is time to order parts for the right head. Unfortunately, I have to order a full set of cast std rings and only use 3 sets. Also need 2 Time Serts for the 2 broken head studs. Buying them in case the worse happens trying to remove the stud stub. Helen trip coming up, so work slowing on all projects. Until 1st week of May. So is the astrological inspection method better than using one of those tiny cameras? What do the stars say about the future of your engine? Oh crap. I missed that Autocorrect. I don't believe in the stars Horoscope or Hollywood. Just the ones in the sky. While we were looking at the engine and discussing the piston repairs, we did find 3 fine cylinders from my used stock that will be honed. They will replace the rusty #3 cylinder and other 2 cylinders because of other little issues. Wow, you engine is in worse shape by far than the 140 I'm working on. the main difference is that mine is frozen solid. I removed the left head, and it looks good, no damaged seats. Engine rotated 350 degrees both ways until it broke through the rust barrier (#3 cylinder). 1 rusted out exhaust tube, 2 broken head bolts (1 upper and 1 lower), 1 corroded piston #5 and 1 rusted cylinder #3 on the RH side. New rings and gaskets for right side. 1 rusted exhaust tube on LH. Replace the oil pan, push rod tubes heat shields. Replace rear cover having oil pump verified as set up properly. Replace top cover assembly with one having new one bearing. Put replacement tins on. I guess a new harmonic balancer is needed at this time. Rebuid a set of carbs I have sitting is storage. Install flex plate and torque convertor. Ready for test. Of course, easier and faster to type. Will take time to complete. Needed external parts being cleaned, stripped and painted today right now. Taking a break. I have all parts handy as spares, except rings and harmonic balancer. Parts came from different part packages/old cars I have acquired. > rust or corrosion on everything. > overheat switch just to monitor them anyway. > keep battery supplied at 2 amps during test. Save the springs! New pumps notoriously have high pressure output. Good timing,kenzen. I pulled the best looking pump I have off the engine prepping for the electric pump mod. I took it apart and there was signs of rust and corrosion. But I think this one may have done the test, except for some trash near one of the valves. I have boxed all the parts for now. To date, no one has expressed an interest in any of these parts. I have no intention of taking parts to Helen as I would want to clean up some of the usable pieces to be presentable. Maybe they will be at Maggie Valley. I did note a difference in these valves. There are 2 types of valves, one heavier than the other. Differences are in bottom mount plate and the mid plate with the valves. Pulled the mount plate and skid plate off the engine in preparation of pulling the harmonic balancer. Once off, I decided to pull oil pump to see if it was serviceable as is. The cover plate is clean and as smooth as glass. The cavity is spotless with no damage. 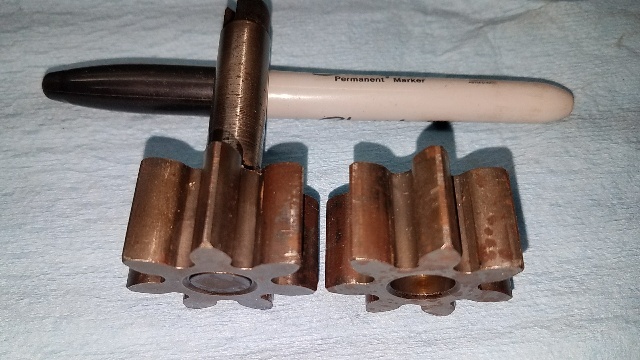 The same is not to be said for the pump gears. They are nicked and plating has been lost. 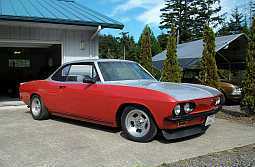 A oil pump will be ordered. 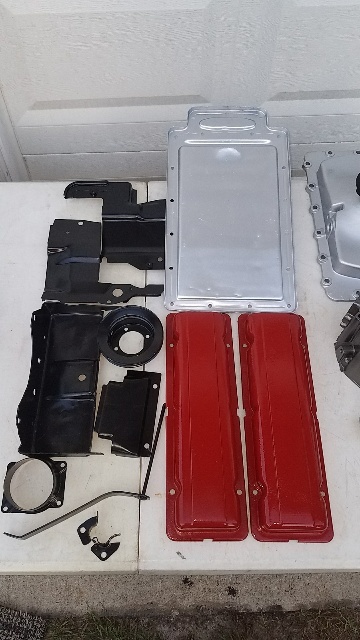 I have a spare rear cover painted and just needs a pump, bypass, gasket and seal. All on hand from Corsa work. Just as simple to setup this cover to replace the one the engine when the balancer is removed. 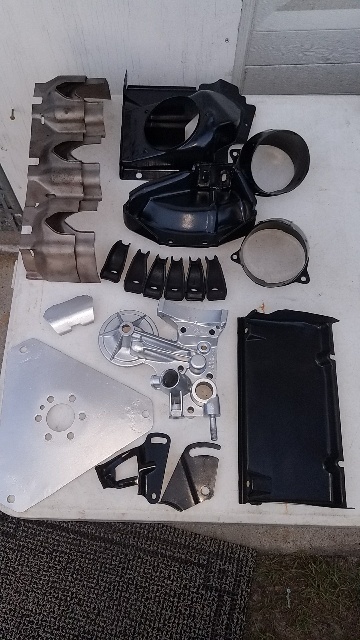 Here are photos of parts we have got ready to put on this 110. A few of these parts were done earlier. Thank you, American Mel. Got to look good when it is running on the garage floor. > one of the valves. I might be interested in the springs just to profile the tensions, as I'm working the analysis of mechanical pumps on another thread. I don't need a bunch of springs, I just want to measure the tension profiles as they compress, and test the output pressures on a working pump, to determine the correct spring design. I'd pay round trip shipping if your willing to support "the experiment". 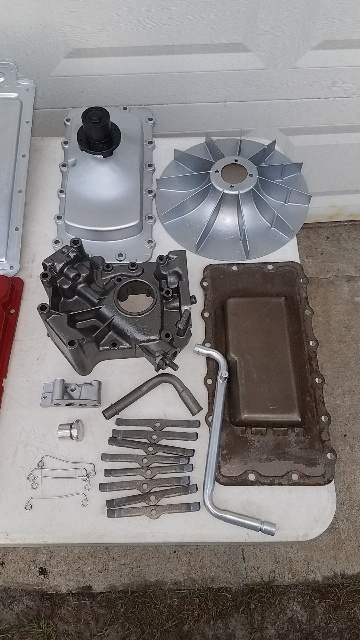 Finally completed an inventory of all parts needed for the assembly of this engine revival. Total number of Replacement parts line items are 84. I have 56 of the items on hand, 23 have been ordered through our vendor with 3 remaining. Holding off on those until we return from Helen. You never know how many items you touch and have to decide if you want to reuse the item. Unfortunately with this dirt laden, mouse house, there is not many hardware items I want to reuse. It is quite an Excel spreadsheet I have put together of all the parts and part numbers just to keep track of each part's status (on hand, on order, installed, etc.). I wanted to clean up the springs and get some measurements before I committed to supporting you. 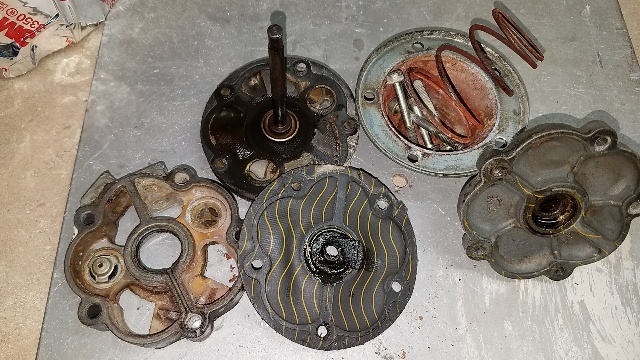 8 of the springs cleaned up. One was broken from the start and one broke during the cleaning. 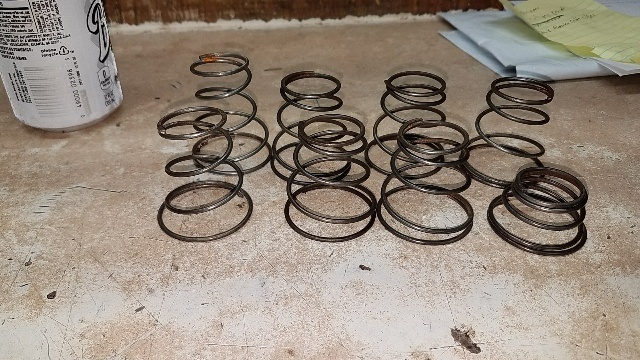 Now I don't know what can get out of these springs. Height measurements are across a wide range. From 0.907 to 2.193. Photo shows what is available. 6 are the 1.80 to 1.95 range. Let me know if you still want them for your test. They are still good for service. So I suspect someone may want to pick them up. Will you be at Helen? Interesting!! Never seen the short spring! Someone needs to install it and test for pressure! 1st package of parts from Clarks for this engine has arrived. 2nd package should arrive Thursday. 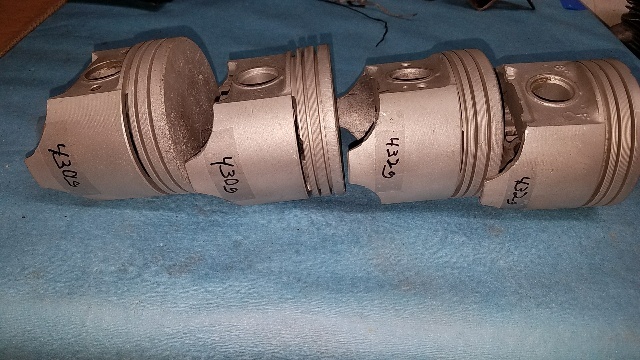 We have 4 used cast pistons to pick from for this engine. They have been weighed and tagged. Each were bead blasted thoroughly by the previous owner and again by me. We will do a dye penetrant inspection on them before we use them to ensure there are no cracks. That short spring has the small amount of coils as the rest. I had to count them to believe it myself. Has anyone seen the 2 different pumps? One having the heavier mounting and middle sections? > measurements before I committed to supporting you. > the start and one broke during the cleaning. > range. From 0.907 to 2.193. > Let me know if you still want them for your test. I won't be at Helen...and yes I can use them for the test. I can ship them back to you. PM me. Thx!